Needless to say, perhaps, fervent Donald Trump supporters and fellow Republican congressmen under the microscope Duncan Hunter (R-50th District) and Darrell Issa (R-49th District) came out swinging today on the Russian field of play. Just from different sides of the plate. Hunter told the Los Angeles Times that the Democrats were engaging in a political “Witch Hunt” against Donald Trump and friends while Attorney General Jeff Sessions had every right to meet with Russian ambassador Sergey Kislyak. Kislyak has been ambassador to Washington since 2008, a post viewed as second only to foreign minister within Russia’s diplomatic hierarch. Hugely controversial, Kislyak speaks perfect English with a Boris Badenov accent. The jury is out on him. Some say he also functions as a high-ranking Russian spy. Others consider him a legitimate long-time diplomat. Hunter suspected Sessions’ failure to disclose the meeting during his confirmation hearing was either a “unconscious mistake” or a misunderstanding, according to the Times. The attorney general likely interpreted the question to be focused on whether he met with the Russian ambassador on behalf of the Trump campaign, he said. “I don’t think he needs to recuse himself, but if he decides to just to calm everyone fears, that’s fine too,” Hunter said during a telephone interview. ‘Tis the season, apparently, for state of the city addresses. San Marcos Mayor Jim Desmond and Escondido Mayor Sam Abed, each gave such state of the city speeches recently. Desmond, a Republican, did the honors as part of the San Marcos Chamber of Commerce Board of Directors’ Installation and Awards Luncheon program. “Presented to an audience packed with leaders, entrepreneurs, non-profits, local businesses, residents and others devoted to San Marcos, Mayor Jim Desmond’s talk highlighted the most significant accomplishments of the last year and outlined upcoming goals in the areas of public safety, parks and community services, community development, traffic and transportation and other quality of life issues,” San Marcos spokeswoman Sarah MacDonald said. Desmond “stressed the importance of the community partnerships to tackle the various issues facing the city—issues such as the move to by-district elections, increasing retirement costs, and re-calibrating the San Marcos Creek District plan to accommodate changing retail and housing demands,” MacDonald said. Want to read the full Desmond monty? Visit http://www.san-marcos.net/your-government/city-council/jim-desmond/2017-state-of-the-city-address. Escondido Mayor Sam Abed gave his version of the annual address to the masses to over 400 people at the California Center for the Arts, Escondido. As has been his wont in last addresses, Abed went video viral with a review of daily Escondido activities and interests along with sound bites addressing increased development and economic activity. The two-term mayor honored the Escondido Charitable Foundation with the Escondido Mayor’s Leadership Award. Also in keeping with recent tradition, the four other Escondido City Council members gave awards ti various residents and businesses. 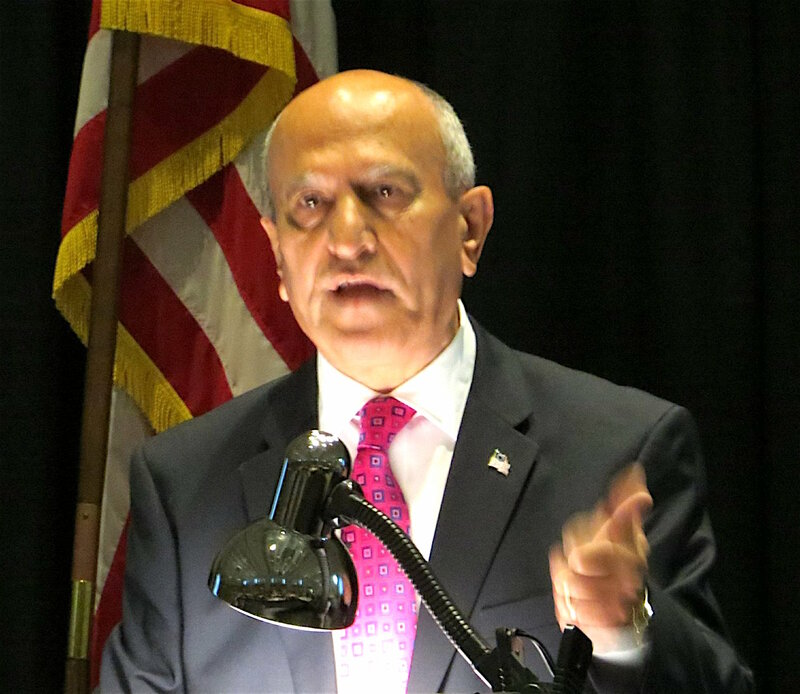 That well-known hater of government, Abed, a Republican, railed against Sacramento addressing the city’s increasing requirement to meet its state obligation that he considered onerous because it pertains to management of state pension requirements. Changes in interest rates require the city of Escondido to pony up $40 million by 2022, according to Abed. The city says $20 million currently. Want to see the entire show in living color? Yes, you can by visiting https://escondido.12milesout.com/OtherVideos/Video/17. Be the first to comment on "Hunter to Issa to Sessions to Russia"